An interview with Dr. Bernath Eugene Phillips (PH.D. Physical Education, Penn State 1941) American Association of Health, Physical Education, and Recreation's Recreational Therapy Section Editor from 1952 to 1958; Recreation Specialist, Special Service, Department of Medicine and Surgery, Veterans Adminiastration; Chairman of the Conference Steering Committee and Conference Report Editor, 1957 Conference on Recreation for the Mentally Ill; and the first Hospital Recreation Director registered by the Council for the Advancement of Hospital Recreation. Jeff Mansfield: Who started recreational threrapy? Dr. Bernath Eugene Phillips: I think in this book (Recreation for the Mentally Ill, November 17-20, 1957 Conference Report, edited by Phillips, and published by the American Association for Health, Physical Education, and Recreation-AAHPER in 1958) you will find it says that the three professional organizations really started recreational therapy; the Hospital Section of the American Recreation Society (ARS-HS formed 1948), backed by Dr. Clifford C. Bream, Jr., I don't know whether Cliff's still alive, probably not because he was older than I was [note: At the time of this interview, Bernie was 85, and Cliff, in his 90's was alive and well. 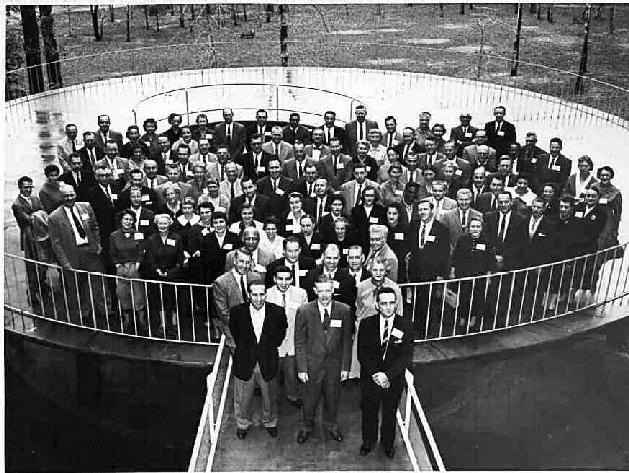 ], the Recreational Therapy Section of the AAHPER (AAHPER-RTS formed 1952), of which I was the editor and author of the monthly column from 1952 to 1958, and the National Association of Recreational Therapists (NART formed 1953). The National Recreation Association (NRA) also began a hospital recreation consulting service in 1953. However, it was a service rather than a professional group. J: So they formed CAHR the Council for the Advancement of Hospital Recreation? B: Yeah, well here (the book) it tells you who the council was, if I can find it, I think you might want to spend a lot of time with this. J: OK, so there were two members from the ARS-HS, and two from the AAHPER's Recreational Therapy Section, and two from NART, plus one hospital consultant from the NRA. B: Two members each, that's right, they would have been appointed positions, they would have held them for a year or two years and may have been reappointed. J: The CAHR was founded in November 1953, after the American Recreation Society created the Hospital Section in 1948. B: Yes, the ARS-Hospital Section was before my Recreational Therapy Section. I believe that was three or four years before, and then NART came after. B: Yeah C. C. was in charge of all recreation service in the VA central office in Washnigton, as time went on I was subordinate to Bream, he was in charge of recreation and I was in charge of adaptive sports when they combined the sports division and the athletics division both under recreation. J: You had written, "The objectives were to assist the doctor in getting his patients well and to make life as satisfying and meaningful as possible for those patients who must remain in the hospital" that is very similar to the objectives of the Council for the Advancement of Hospital Recreation. B: I think they were all very similar. J: Were the people on the council working in hospitals? B: Not all, I think Jack Anderson (AAHPER Director) was on the council. Each of us appointed two, but I don't know that any of them were particularly hospital people. J: How did recreational therapy begin? J: Is there any one person who stands out in your mind as the person who developed recreational therapy? Perhaps Dr. John Eisele Davis or somebody like that? B: That's a good question but I don't know if I can answer it, because there were two or three. Now Davis preceded me in the profession, if you want to call it that, but I don't know, you see nobody heard too much about John, he was a recreational therapist at Perry Point and did some writing, how well it was recognized I'm not certain. I think that strictly for psychiatric patients, John did very well. I don't know how I would answer that question, Jeff. I would like to, but I can't. J: So, if there wasn't a particular person, do you think there was a particular event that promoted recreational therapy as a profession rather than just an adjuvant treatment used by other allied health professions? B: I think that probably its impetus, really from what I hear nowadays, was in WWII. Of course, being at Walter Reed General Hospital, we were advanced in almost everything we did. Maybe not too far but, ... we had wards of paraplegics all in striker frames on ward, and we started wheelchair basketball. In all honesty I think that probably my sports technician -- if I can recall probably Eckland (?) -- at Los Angeles/San Fernando, he really probably started wheelchair basketball. And, of course that stuff, we were on Time magazine with the wheelchair basketball. J: And that would have been about 1946? J: So, Pixley was in charge in '45 and them you took over? B: Yeah, Pixley was. In those days it was called the Athletic Service (AS). The AS in those days consisted of Library Service, Canteen, chaplaincy, and three or four more. J: Did General Omar Bradley start the VA Special Services? B: Yes, General Bradley was the first VA administrator, and Carl R. Gray, Jr. was second. I remember him (Gray) because in 1951-2, I went to Berlin with the state department as coordinator of recreation and sports specialist. He would always ask me to tell him about Berlin. J: Bradley then created the positions, and paved the way for the payment of people as recreational therapists or hospital recreation specialists? B: Now you see this was set up by General Kerr who at the time was assistant administrator ... you had canteen and so forth. That's when all these jobs were set out really. J: So General Kerr actually set up the special services initially then? B: That isn't to mean in your old VA. Before 1946 you had the veterans administration nobody wanted to go to. It was Bradley who really created the new set up; with Gen. Hawley the chief medical director, and Kerr. J: When you were starting with hospital recreation, were they referring to the treatment as recreational therapy? B: Depends on where you were. I should correct something I think. Technically, I think could never say really, although I had some of these recreation assignments, it wasn't my primary interest which was first physical education--adaptive sports particularly--because recreation includes so many things, like music and art and literature and all. I was interested primarily in the sports aspect, except when I got with the AAHPER just for a month as a recreational therapist. Although for those six years from 52 to 58, I covered the field of recreational therapy as thoroughly as I could. J: The use of the title, did CAHR issue cards or certificates with recreational therapy on them or was it hospital recreation? B: There were three titles, Hospital Recreation Director, Leader, and Aide. J: When did the debate between recreational therapy and therapeutic recreation begin? It was mentioned in your March 1956 column, and didn't you open with that as the main topic of discussion at the 1957 conference? B: Back in 1945 Dr. Paul Haun and I would sit around in the evenings debating the pros and cons of what to call the profession. Yes, Paul would have called it recreation therapy. I think that some of the people who want to be closer to the medics want to call it therapeutic recreation. You know, how are you going to determine if a motion picture is therapeutic or not. It just doesn't make any sense. Now I can't remember how or why we got into discussions like that, but we spent a lot of time talking about it. One thing that I want to call to your attention in the back pages [of the book] since it was not possible to get it into the conference as much as we wanted to, here Paul Haun, "Hospital Recreation, A Medical Viewpoint" Appendix E that was one of his better papers I think, and he told you the difference there of how he conceived of recreation and recreation therapy. He also led one of our discussion groups. Paul was also very complimentary of the profession at the Atlantic City 40th National Recreation Congress. J: You know, they still haven't resolved it, it's still controversial. B: I don't believe it. J: So, it started out as recreational therapy, then they wanted to be seen as more clinically orientated, for respect, so they called it therapeutic recreation? J: Now, because they don't consider the field of therapeutic recreation to be as clinically based they've gone back to using recreational therapy as the more clinical term, saying that recreational therapy is defined as an adjunctive treatment. B: Well, I think recreational therapy really is probably more to the point because therapeutic recreation, anything can be therapeutic or not therapeutic and what's therapeutic mean? J: Peterson & Gunn developed the tripartite theory. It's essentially a spectrum where you have recreational therapy on one end, as the more clinical aspect of it, then you have leisure counseling and leisure education in the middle, and then adaptive sports and adaptive recreation at the other end. They refer to therapeutic recreation as the entire spectrum with recreation therapy being at the clinical end. B: You see recreation can be so all inclusive it can be everything, and I never knew quite where to draw the limits. B: You say I wrote that? That's pretty good. Let me see it. J: When they started the hospital recreation program, how well accepted were you by the other allied health professionals? Did you feel like you had their respect? B: When you say other, do you mean just in recreation? B: I don't know that I could answer that because you're going to have interlacing, competition, but I think that most of the top people recognize, you know they couldn't really argue with me, I had a PH.D. degree. You never know whether you're accepted or you're not accepted. I never gave any thought to that. As you say there is still an argument about therapeutic recreation versus recreational therapy, so there must be something to the argument. J: When you started registering the hospital recreation professionals, was it to protect the public, to make sure that they were well qualified personnel, for the safety of the public, or was it a need for recognition? B: You know I hate to answer that , but I think its probably the latter. When I say recognition, it was always assumed that you were doing something for the public, but then whether you say we can compete with corrective, there's no reason why we ever had both really. Dr. John Davis got into pushing corrective therapy. The primary thing he knew was recreation for the mentally ill for the people he had over there at Perry Point. J: What about occupational therapy? B: We had occupational therapy and physical therapy during WWII, and if they had both been built up to what was necessary, I don't think you'd ever have any of these other therapies, because occupational and physical therapy take care of just about everything. What happened you see is there was nobody to do the job, so they got all these physical education majors who knew as much if not more about it than they did, and that's what happened, when recreation people came in and knew much more about it. J: So, there was a great need because of the war and the VA couldn't get enough certified OT's and PT's? B: Oh yeah, we had wards and wards of paralyzed vets and a schools full of amputees. J: Did you work more with adapted sports than with the mentally ill? B: Well I can't say that because I used to go to these state psychiatric hospitals and lecture every year and most of our people were from mental hospitals. Adaptive sports was more specific, if I had been a therapist at a local level I could answer your question a lot easier than being director of the program. As director of the program you try to facilitate their doing the best job that they can. J: Did you have a vision in mind when you started as director of the program and during that period of time that you were in there did you see it going in that direction? B: That's kind of a difficult question, whether the vision comes first or the action comes first, I never gave it much thought. You see in those days if there was any problem with where you were going it's whether you're going to be recreational therapy or therapeutic recreation. 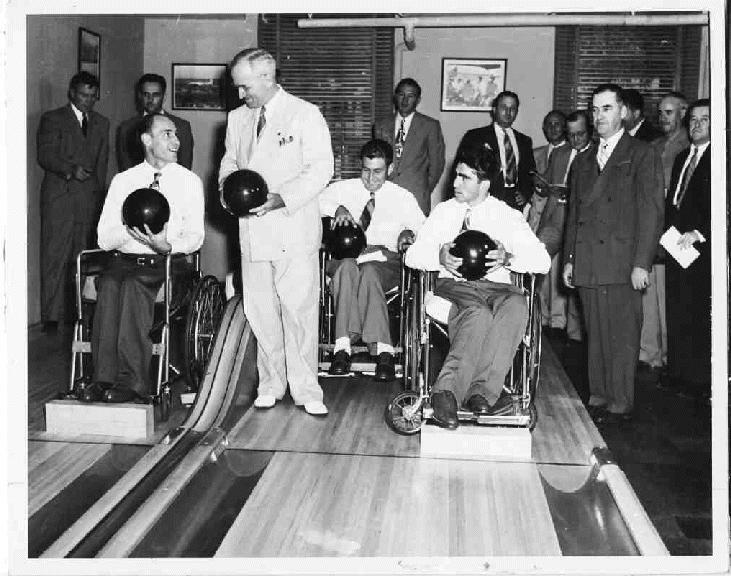 Adaptive sports was more limited and recreation oriented. I just wanted the therapists to be the best they could be. I wasn't trying to push one particular thing. B: Marty Meyer from Newark University he was on my staff, he's been for the last 20 years or so the Associate Director of Mental Hygiene for the state of Indiana, and here's Paul Haun in the center here, of course I was on the right here, and there's Cecil Morgan who was at Springfield College ..., and there's Cliff Bream (Chief, Recreation Division, Special Services, Department of Medicine and Surgery, VA WA) here, Ed Kelly back there, he was in charge of motion pictures for the VA.
B: Here's Ebersole who started it (BVL) on the right, and I'm back there in the corner. 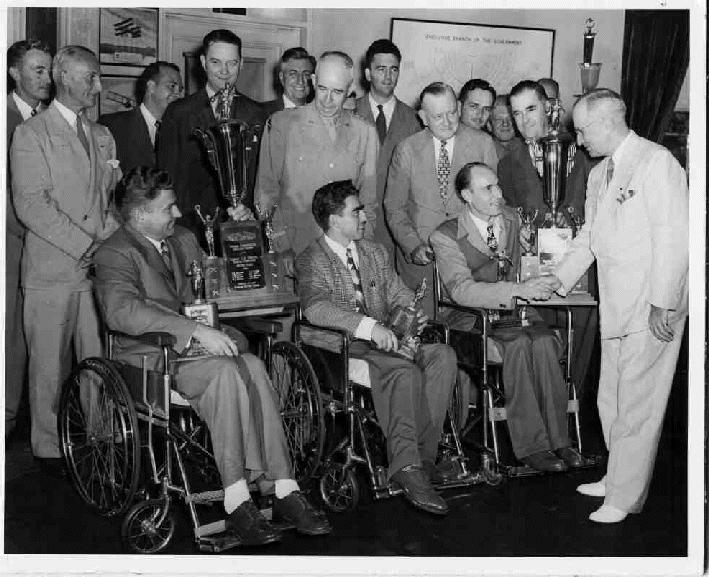 B: Here's Bradley and Gus Mason, Howard Rusk, Hawley , Ebersole, Harry Truman, and the three winners. B: Gray (Carl R. Gray Jr. on the left) is giving the BVL Director A.L. 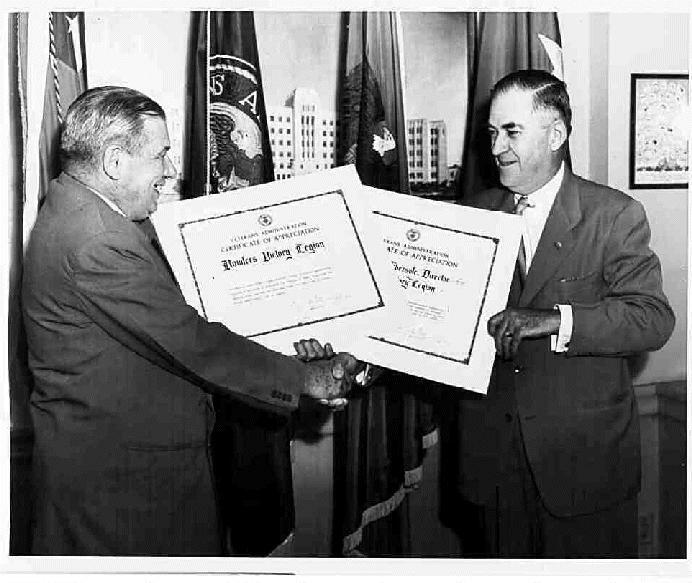 Ebersole (on th right) a VA Certificate of Appreciation back in 1952.